A couple of days ago Desiring God released a new book that sounds interesting. 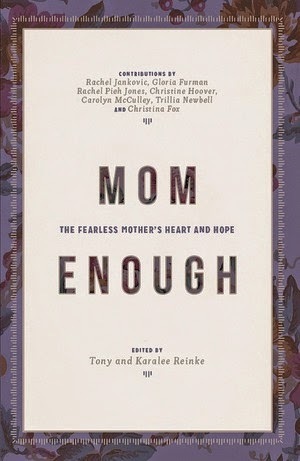 The title is Mom Enough: The Fearless Mother's Heart and Hope, and it is a compilation book by the following authors: Christina Fox, Gloria Furman, Christine Hoover, Rachel Jankovic, Rachel Pieh Jones, Carolyn McCulley, and Trillia Newbell. The book is edited by Tony and Karalee Reinke. Our new book cuts through the nonsense of competitive mothering. Eight bright women expose the spiritual corruption of it and explore how gospel grace is relevant for the daily trials and worries of motherhood. In the trenches, these moms have learned to redirect their hope and trust from the shifting sands of popular opinion to the unchanging all-sufficiency of God. I haven't actually read this book yet, but it sounds interesting, so I am sharing it for all of the mothers in my life that I know. There are three digital formats of this book that are currently free and will work on your kindle or ipad. You can find these free versions by clicking here.